Six grand for a new TV? You're having a laugh. For that we'd want a TV, a car and a holiday in Hollywood, yet that's the asking price of a new 3DTV. And you can bet some people will pay it too, particularly audio-visual enthusiasts. AV fans, lest we forget, would happily spend hundreds of pounds on an oxygen-free, organic copper, hand crafted single-direction cable and claim it heralded a new age of enlightenment. Us mortals with human senses and inhuman bank managers can only look on and wonder. Those cables are probably poppycock, but could 3D be the real deal – an actual revolution? If you've not got a king's ransom to spend but want to find out for yourself, don't fret – Cyberlink PowerDVD 10 Ultra 3D could be the answer. It aims to transform your DVDs into an all-out 3D experience. Before we get to the caveats, let's have some fun. Cyberlink claims it can transform or upscale video in almost any digital format and turn it into just about any type of 3D movie. All you do is insert a DVD, click the interface's '3D' button, select the depth of field you'd like and choose your display system: TrueTheater 3D will do the rest. The results are, as you'd expect, variable. Take a rough old 2D movie (we tried a Rolling Stones concert) and things go wrong: we found that occasionally a guitar appeared to pop out of the screen. So don't expect your Dad's Army DVD collection to be transformed into an Avatar-style 3D spectacular. But give the system an old 3D movie that demands red-and-blue glasses, wait for it to do its work and then don a pair of Nvidia's 3D glasses, and the results are more convincing. Finally, when Blu-ray 3D arrives, Cyberlink will offer a free patch and you'll be able to watch the latest generation of digital 3D movies at home. With this grade of source material you'll experience 3D as it's intended to be seen by the movie director. Now those caveats. First, don't expect PowerDVD 10 Ultra 3D to transform a tired old Pentium 3 into a home entertainment system that will make you spill your popcorn. You'll need a solid dual-core processor and a modern graphics card – an ATI Radeon HD2400 or an Nvidia GeForce 8800GT are the minimum. For 3D playback you'll also need a 3D display and some 3D glasses. A Samsung SM2233RZ 3D monitor and an Nvidia 3D Vision setup would be perfect, but will probably cost you £350 all-in. There's one final problem: the headaches. Following a demo of PowerDVD 10 on the best kit available, some of our team experienced terrible eyestrain and headaches. Many people are concerned about 3DTV and headaches (join the debate on our website), so before splashing out on the equipment you need to see 3D, give it a good long try in person. With some aspirin. Moving beyond 3D, PowerDVD 10 still has plenty of tricks up its sleeve. Fans of PowerDVD 9's brilliant movie upscaling system will be heartened to know that Cyberlink has improved it further. 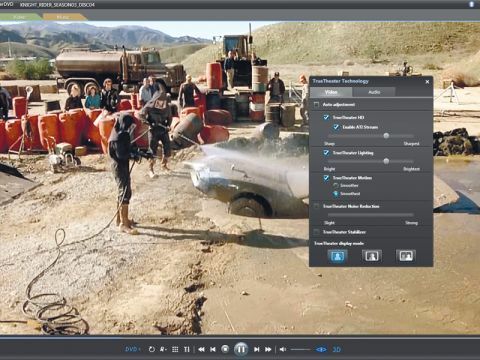 This feature does a splendid job of converting standard-definition video into something that looks distinctly HD. It's not perfect, but the difference is notable, especially when the two videos are viewed side by side. Elsewhere, if you have a NAS groaning with movies and music, it's an easy job to point PowerDVD 10 at it and stream the content. Compare PowerDVD 10 with the free and fantastic VLC player and you'll find Cyberlink's program much more refined and frankly easier to configure. If you're keen to experience 3D, this latest PowerDVD certainly offers a much cheaper route than buying a 3DTV, even when you factor in the hardware requirements. If you use your PC for DVD playback and you're not using Cyberlink's upscaling system, you're missing out. The most basic £40 version of PowerDVD supports it, and it's worth upgrading your DVD software just to get your hands on that one feature.